If you have seen all the cute fox stamps and papers out now, you will know what inspired this gift box and card. Foxes are so popular. I was in a department store recently and saw a box made in this fashion and decided I just had to try to recreate it! The face is a flap that lifts up. The finished box is 5 inches wide, 1-1/2 inches deep, and 4 inches tall. It is large enough for some candy, a small gift, small note cards, or even a gift card! The card shown does not fit inside the box, although you could easily make a smaller version that would. The card is a standard 5-1/2 x 4-1/4 inch, top folding card, and is not meant to go inside the box. 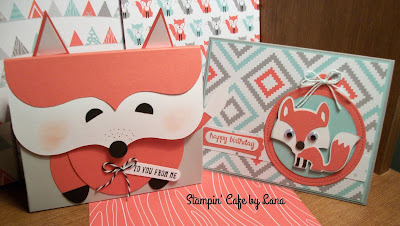 I used A Little Foxy DSP from Stampin' Up and cut the fox from the Create a Critter cartridge at 2 inches. The card base is smoky slate, the circles behind the fox are calypso coral and soft sky, and the fox is also in calypso coral and white. The greetings on both the box and the card are from And Many More" by Stampin' Up. If you would like directions on the box, I took pictures of all the steps and have written directions below. Start with a piece of cardstock cut at 8 x 11-1/2 inches. I used smoky slate (gray), but I have also used kraft and both work well. Score the 8 inch side at 1-1/2" and 6-1/2". Score the 11 inch side at 4", 5-1/2", 9-1/2", and 9-3/4". The top will be the side with the score lines close together. Trim off the top corners as shown, and cut the score lines in the middle as shown. Then add a strong adhesive, score tape, tear and tape, etc. to the pieces as shown below. Bring the top half of the box down to attach to the inside flaps on each side, then bring the bottom up and attach the sides. It will look like the picture above. Don't worry about the short flap remaining on top. This is the base for the fold-over face pieces. Pinch in the sides of the box as shown and pin to make it easier to attach the flap pieces. Cut two flap pieces for the face using the Elegant Edges Cricut cartridge, p. 25, cut at 5 inches on the book setting, in white and orange. You could also use some other die you may have. With the points facing to the left on your score board, score the orange piece at 1-1/2" and 1-3/4". Score the white piece at 2-3/4" and 3". Leave the white piece at 5 inches and cut the orange piece down to 4 inches. Fold along the score lines and crease with a bone folder. These need to be crisp folds. Next, attach the white flap to the flap on the box, matching up the score lines on the box. It works best if you use liquid glue and attach the piece to the box while holding the box upright and laying the flap on top of the box. Glue only the top flap on the box and the bottom of the white flap. Do not glue the small area in between the thin score lines. Then working in the same manner, glue the orange flap on top of the white one. This forms the top of the fox's head. For the body on the front of the box, I used punches and dies. I punched out ovals for the haunches using a 1-3/4" x 7/8" oval punch, a 1/2 inch circle for the nose, and cut a 1/2 inch circle in half for the eyes. I cut the body from an oval die measuring 2-3/4 x 3-1/2", and fashioned a tail from the space left after cutting the oval. I also hand cut the tip of the tail in white. Cut the pieces and assemble as shown. I attached a small flat magnet under the nose and onto the body. I covered the magnet on the body with a 1/2 inch circle. I added a little "blush" with some light pink ink on a sponge dauber. For the ears, cut two triangles in orange, and two smaller ones in white, glue together, and attach behind the top of the head with glue or glue dots. If you want to embellish it further, add a greeting and bow! I hope you enjoyed this week's project. Let me know if the directions aren't clear enough and I will be more than happy to clarify them! Happy crafting! Thank you Anne! I'm glad you liked it and that the directions were good. I hope you enjoy making it! Snow Fox - Let it Snow!